As promised here’s the summary of our adventures in New York and Niagara Falls for those who have been following our Journey on Twitter and Instagram. Connecting with other educators on Twitter has enhanced the experience. My twitter network have helped recommend places to check out and it has been invaluable for connecting face-to-face with other educators in the different cities we’ve visited. You’ll find my guide to using Twitter here. Instagram has been a great way to quickly share photos from our trip. Here’s how to use Instagram. Apologies but it is another long post. Feel free to jump to the sections that interest you! 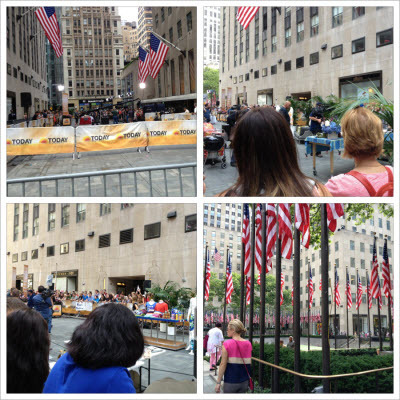 We started off the day with a visit to the Rockefeller Center where we saw the Today Show being filmed outside as part of the 4th July celebrations. It was great walking through the crowd seeing all the people wearing 4th July clothes. Visiting the Empire State Building was a prefect way to start off our visit to New York. You can now purchase an audio-visual tour, which uses an iPod Touch. As you view sights from the Building the tour provides an excellent introduction to New York and the Empire State Building. Well worth paying the extra for the audio-visual tour. We also visited the Empire State Building 102nd floor which is something I didn’t do last time I was in New York. My Mr13 hadn’t been keen to go up to the 102nd floor but was really glad when we did and thoroughly enjoyed it. Being less crowded made viewing the sights better. Grand Central Terminal is an important New York landmark and is located 5 minutes walk from our hotel. Well worth the visit to check out the beautiful architecture, Grand Central Market and the Apple Store (a must visit for all Apple lovers). 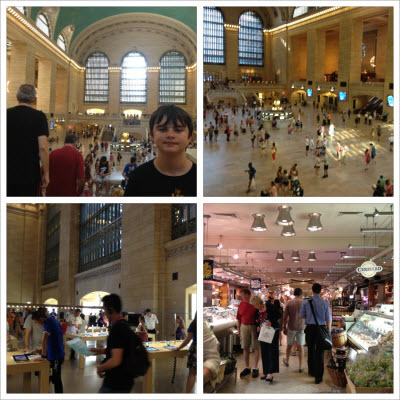 We had wanted to do the audio tour of Grand Central Terminal but ran out of time. 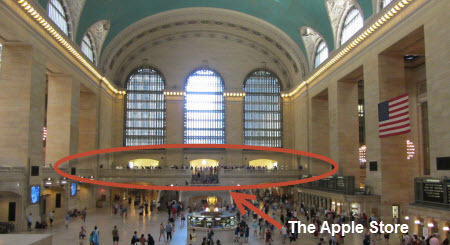 The Apple Store is located on a Grand Central balcony overlooking the Station and is one of the most impressive Apple stores I’ve visited. Times Square is one of the World’s most visited attractions. 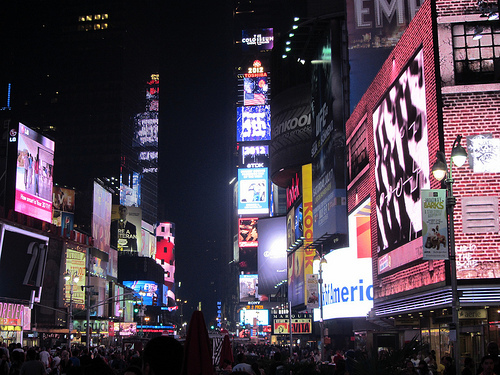 The zoning ordinances in Times Square requires building owners to display illuminated signs which gives it a very distinctive feel. It is also where you’ll find most of the Broadway shows. And before any one asks — No! We did not go to a Broadway show. We were time challenged! 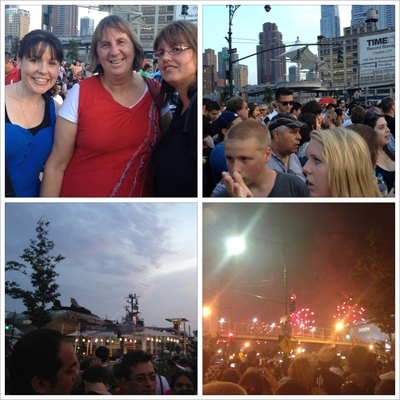 We finished off our day watching the 4th July fireworks near the USS Intrepid Museum on the Hudson River with our Aussie friends Ann Mirtschin, Kathleen Morris and Nate Morris. The best part of this was spending time with our Aussie friends. I didn’t enjoy the fireworks but am glad we went to see what it was like. I really had expected it to be much bigger, and better, than Perth’s Australia Day Sky Show when in reality it was the opposite. It made me appreciate how special our Sky Show is and the work involved in making it happen. But I also appreciate now why they couldn’t do the same as our Sky Show in NYC. Our sky show has a crowd ranging in size from 200,000 to 400,000 supervised by a strong police presence. It is a full on event with scheduled activities happening all around the Swan River during the day and into the night. The fireworks are coordinated to Australian music which is simulcasted through a local radio station; and everywhere you can hear music while watching the fireworks. The fireworks stream off tall buildings and are on barges on the Swan River. They also start our fireworks with an Australian flag being flown around the Swan River under a helicopter with our National anthem playing. NYC has millions watch the fireworks and it would be impossible to supervise that number of people if they tried to hold an event similar to ours. 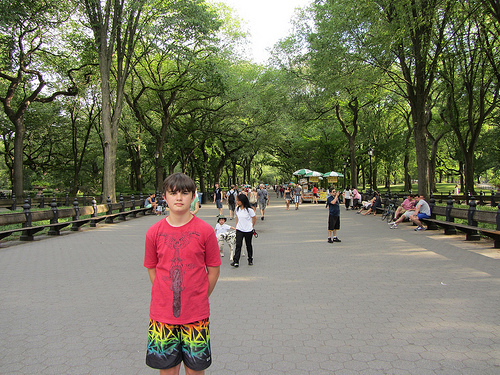 I really love Central Park. You could spend days in Central Park and still never see everything Central Park has to offer. There is a trick to not getting lost in the Museum of Natural History and I still haven’t learnt it! This time I downloaded their Museum of Natural History Explorer app (you can check out all their apps here). 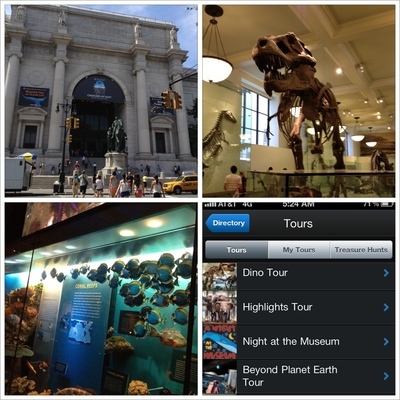 The Explorer app is packed full of lots of great Museum adventures including Dino Tour and Night at the Museum Tour. Even with the built in directions and GPS I managed to get lost. Fortunately Mr13 is good at reading maps! We really enjoyed the Museum of Natural History. We would have loved to spend a lot longer there. Our favorite exhibit was the Ocean Life Hall. Each city we organised an all day tour so we make sure we see the city highlights. In NYC we did the Grayline’s Manhattan Experience. The tour was okay but I preferred the See it All NY tour we did last time I visited NYC. With the See it All NY Tour you get off the bus with the tour guide at each stop. The tour guide walks you to the location so you get a really good view of the sight and an excellent overview of what you are seeing. On the Manhattan Experience you drive past most the sights on the bus, which I struggled to see, and only stopped at four locations to get off the bus. One of the stops included 40 minutes at a souvenir shop. I would have rather spent longer at General Grant’s tomb so we could have gone into the tomb or gone to China Town and walk through it than spend time at a souvenir shop. The tour included a stop at Little Italy and people could have brought their souvenirs there. 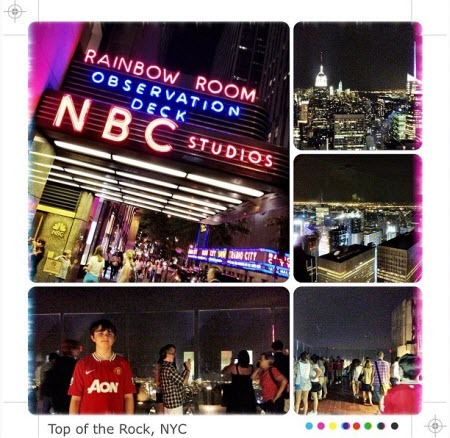 The Top of the Rock was included in the Manhattan Tour but you could use the entry ticket at any time so we decided to visit it at night because we had already done the Empire State Building during the day. The Top of the Rock and the Empire State Building both give you views of NYC. 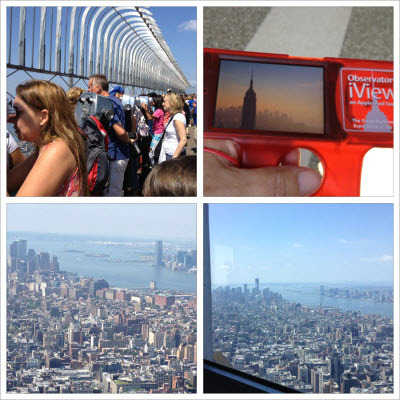 Personally we liked the Empire State Building more because the audio-visual tour enhanced the experience. I also preferred the view during the day rather than the NYC lights at night. The NYC subway is one of the oldest and most extensive subway systems in the world and we decided we wanted to learn how to use the subway. We did feel a bit intimidated initially because it is big subway system and we rarely use public transport at home. Use with caution during rush hour as you may get trampled – almost happened to me). Don’t use at night – use taxis. Watch out for pick pockets – pretty sure a woman tried to pick pocket me on my first subway trip. Learn which direction is Uptown and which is Downtown – or in my case use the HotStop app (see below). The subway is definitely the cheapest way of getting around NYC and all you need to do is buy a Metrocard. You just swipe the metrocard as you enter into the subway. We purchased 7 day unlimited metrocards but we would have probably been better sharing a Pay-Per-Ride Metrocard. Easiest option for finding your way on the Subway is to download the HotStop app which you use to work out which subway station and subway you need to take. Only other point I would make is last time we used a 3 Day Hop on Hop off bus pass. This was good for the first day but wasn’t time efficient for other days because you are restricted to waiting while the bus stopped at every stop to get to the location you want to go. I’ve always wanted to walk the Brooklyn Bridge because it is one of the oldest suspension bridges in USA with an interesting history. So we were both very excited to walk across the bridge! 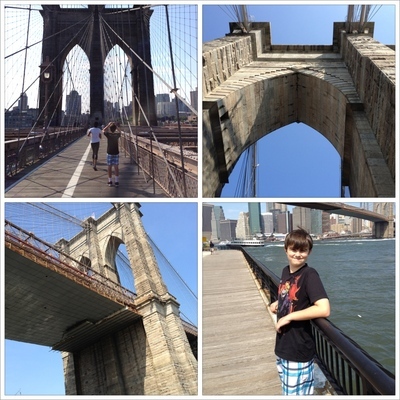 I really wish I had read Jo Hawke’s post on Brooklyn Bridge before doing it as she has so many cool tips of extra things we could have done! 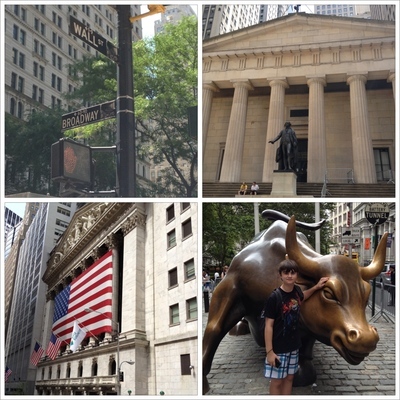 Wall Street is the financial District of NYC and is what makes NYC one of the World’s principal Center’s. Wall Street is a key tourist location as people come here to see sights including the NYC Stock Exchange, the Federal Reserve, Federal Hall National Memorial, The Trinity Church, St Paul’s Chapel, the Charging Bull, the Bowling Green, the World Trade center and it is close walking distance to all major ferry piers (such as Statue of Liberty tours, Staten Island, Governor’s Island). Since 9/11 there is a very strong police and security presence in this area. The biggest change since last time I visited NYC is they now have 24/7 police guards on the Charging Bull. The Charging Bull is located in the Bowling Green near Wall Street and represents the aggressive financial optimism and prosperity. It is one of NYC’s most photographed artworks and a popular tourist destination. The aspect that had the biggest impact on us was visiting St Paul’s Chapel and learning more about their work during 9/11. St Paul’s churchyard is opposite the World Trade Center. 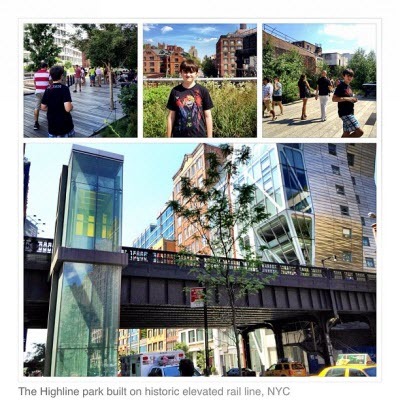 The High Line is 1.6 km linear park built on a section of the former elevated rail road which runs along the lower west side of Manhattan. The High Line park was a sight that my Twitter network recommended that we visit and I’m really glad we did. It is very spectacular; they’ve done an amazing job building this park along the elevated rail road. It is an extremely popular tourist destination. 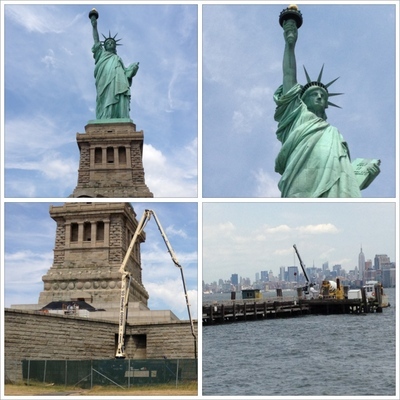 I was undecided if we would go to visit the Statue of Liberty and Ellis Island because it was very busy at this time of the year and the Statue of Liberty is currently undergoing 12 months restoration. But I’m very glad we did. The queue to visit Statue of Liberty wasn’t bad and nothing beats standing on Liberty Island looking up at the Statue of Liberty. 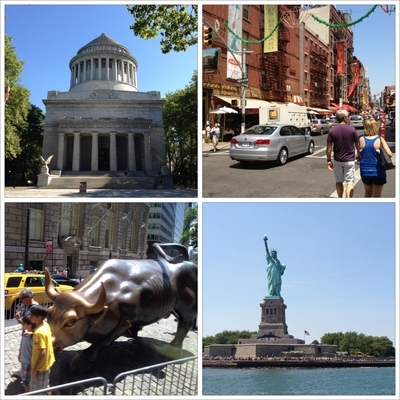 Audio tours for the Statue of Liberty and Ellis Island are now included in the cost of the visit which makes it one of the most economical NYC full day activity. We started off our visit to Liberty Island in the Information Center watching the Story of the Statue of Liberty. This provided us with a very good introduction to the history of the Statue and then we followed it up by checking out the sights while listening to the audio tour. Rather than being put off by the restoration work I found it fascinating. I enjoyed watching them transporting the concrete trucks on the barge. Ellis Island was America’s largest and most active immigration station. From 1892 to 1924 over 12 million immigrants were processed on Ellis Island. 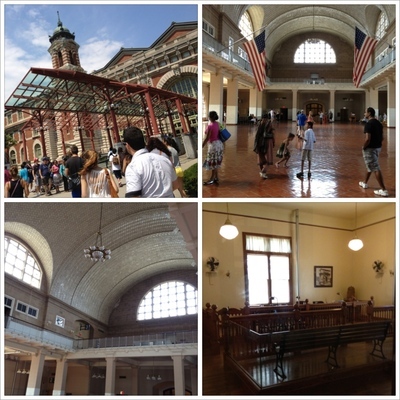 Last time I visited Ellis Island I struggled to get a lot out of the visit. This time I was determined to get a better understanding of it’s role in immigration. This time we started our visit off by watching the “Island of Hope, Island of Tears” Movie. This really helped me understand it’s history so when we walked around listening to the audio tour we could visualize what it might have been like for the immigrants. Our afternoon on Ellis Island made me reflect on why my ancestors decided to migrant and why they chose Australia. An interesting fact I hadn’t appreciated before was steerage and third class passengers were processed through Ellis Island where they underwent medical and legal inspection. Whereas first and second class passengers normally weren’t subjected to this process, unless they were obviously sick, and were free to enter USA because it was believed if they could afford the cost of the ticket on the ship then they were financial enough to support themselves. We covered over 1400 km (over 800 miles), and over 8 hours per day traveling on the bus, to visit the USA and Canadian side of Niagara Falls. It was worth every minute! You really need to see Niagara Falls to appreciate how incredible it is! Hopefully my video of Niagara Falls gives some sense of how impressive it is? 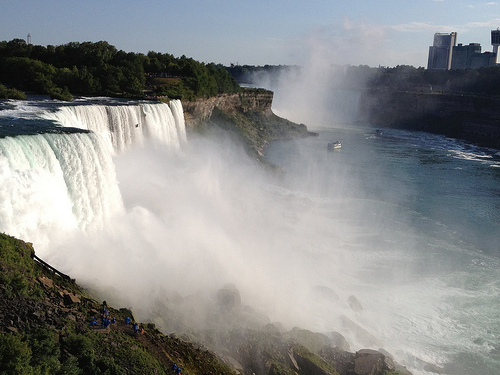 You can check out all our photos from Niagara Falls here! 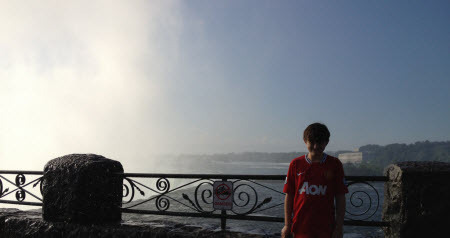 We hadn’t appreciated the amount of mist Niagara Falls produces. The volume and speed of the water flowing over Niagara Falls creates an incredible mist plume which you see from miles away as you’re approaching the falls. When we stopped next to Horseshoe Falls the mist was being blown at us and it was like standing outside in the rain (which is why Mr13 looks so wet). The amount of mist and height of the mist plume is directly related to the temperature difference. The greater the difference between air temperature and water temperature the more mist produced and the higher the plume. Mr13 getting wet from mist falling from the Horseshoe Falls (Canadian Falls) at Niagara Falls, Canada. Probably like most people I hadn’t realised that Niagara Falls is made up of three falls. 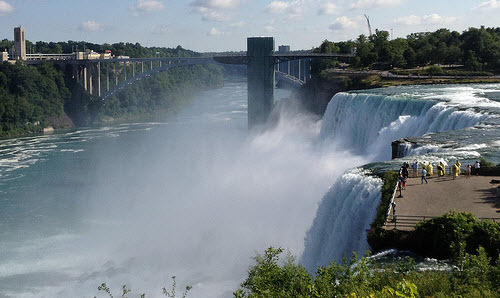 American Falls and Bridal Veil Falls are located in USA. View of American Falls from the Maid of the Mist viewing platform on USA side. The Horseshoe Falls (also known as Canadian Falls) is located mostly in Canada and 90% of the water flow from the Niagara Rivers flows over the Horseshoe Falls. 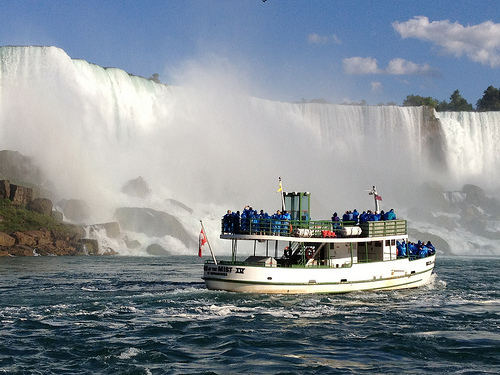 The Maid of the Mist going under the Horseshoe Falls. 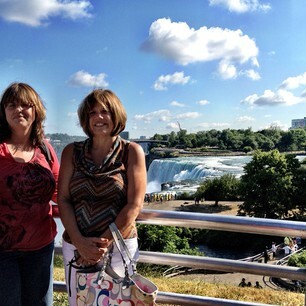 Viewing Niagara Falls from both sides is definitely the way to go. A visit to Goat Island in USA allows you to get scarily tooooo close to all the falls. American Falls from Goat Island. And yet again Twitter was invaluable! We had an excellent time exploring Goat Island with Heidi Chaves. Visiting Goat Island with Heidi Chaves. Hope you’ve enjoyed the highlights of our travel so far. Our next destination is Los Angles which I’ll cover in my next post.